Wee Small likes to spend all of her time barefoot. Her toes need to be in constant touch with the earth. However, it is winter on tummy mountain, which means sometimes I insist on shoes and socks. The kind without holes. And sometimes we have to buy new socks. The Little One (being the eldest) and Wee Small made Little Hoot out of Wee Small's new socks. They think I don't know that. The Little One (being the eldest) made the body. 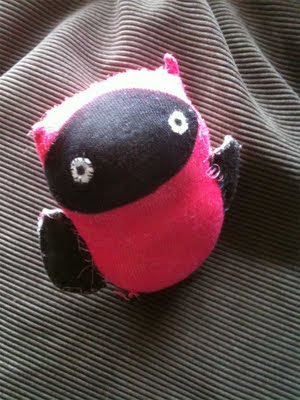 And Wee Small did the eyes and wings. I don't know where the little ones have put the other sock. They must have disposed of the evidence. HA! Yes that tummy is looking a bit suspicious! I like your artwork. I do a blog about fun photo editing, but I haven't got much attention. My blog is at funwithimagemanipulation.blogspot.com. Please tell your friends about it. I like Little Hoot and I' thinking Humel is onto something there. He certainly doesn't look hungry. I agree with you Martha, I think Humel has definitely spotted something I missed, and that Little Hoot's tummy warrants closer investigation.